I’ve had pets all my life, but it wasn’t until recently that I began having companions. To put this simply, anyone can love a pet. We love them for all they do for us: they make us feel comforted, understood and supported when times get tough; they make us laugh and smile with their silly antics; and they can even make us cry when they fall ill and pass away. But when does an animal stop being a pet and start being a companion? The answer: when we stop focusing on how they make us feel and start focusing on how we make them feel. Anyone who has ever truly loved someone will tell you that love is selfless. With love, there is no room for ego or pride. Love is something we give to someone without expecting anything in return. Of course, we love to feel loved as well, but (real) love is not a form of bribery. If we truly love someone, we love them for who they are, not what they can do for us. Furthermore, real love is not contingent on whether someone can or will love us in return. So at what point do you go from simply thinking you love animals, to actually loving them? The answer: when you go vegan. To be an animal lover, we cannot restrict ourselves to loving certain animals over others — we must love all animals equally. I spent many years of my life thinking I loved animals without ever knowing what it was like to really love them. Though I may have felt a sort of affection for the animals close to me, I could not be considered an animal lover because my compassion did not extend to all species of animal, regardless of whether I had a personal relationship with them or thought of them as “cute” or “smart”. 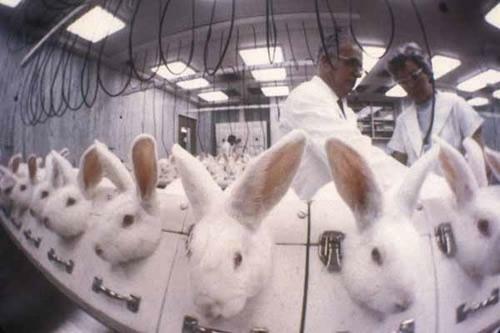 Rabbits undergoing a draize test to determine if a product is safe for humans. 94% of all animal testing is done for cosmetics and household products, leaving only 6% for medical research. The UK, Belgium and the Netherlands have already banned all cosmetics animal testing, acknowledging that it is cruel and unnecessary. For more information on animal testing (AKA vivisection) please click here. Actions will always speak much louder than words, so how could my actions toward animals be considered love? I drank fluids that were stolen from their bodies — fluids that were designed by nature to feed their own children, who were instead enslaved and murdered on my dollar; I used make-up, personal hygiene products and household cleaners that had been used to torture and murder them; worst of all, I ate their hacked-up, rotting corpses! Words cannot begin to describe how utterly ashamed I am for the injustices my actions and inactions have caused them over my lifetime. But the blame doesn’t rest solely upon my shoulders. Had I been taught from an early age that an alternative existed, I may not have chosen to continue eating the mutilated cadavers of the animals I had claimed to love so much in the past. Had I not been misinformed that this was “the way things are”, “the natural order” and “the circle of life” while growing up I may have actually had a choice. The truth is, not only was I never given a choice, I never even knew a choice existed. But it would be unfair to blame my parents for something they may have never known about themselves. In many ways, they were in the dark just as much as I was. Society pressures you from every angle to be a mindless, obedient, eager-to-please robot. Stray too far from the predictable cookie-cutter mold society wants you to fit into and you risk ostracisation and ridicule. It’s up to you to break free from it. You have to decide to stop being society’s puppet. Stop and think for once. Think about what effects your actions cause. There is more than just you, the people close to you and the present moment. There is a bigger picture. Our actions can either yield amazing outcomes or tragic consequences. I refuse to rub my dog’s belly with one hand while simultaneously stabbing another animal in the heart with the other hand simply because I’ve been told by society that this is just the way things are and always will be. The point is, this isn’t the way things have to be. I have my own brain, my own will and my own choice. I choose to love animals. Thinking back to my non-vegan past, I am haunted by images of the horrible atrocities I was perpetuating. The blood dirties my hands and mouth. It is absorbed into every pore and sinks deeper and deeper until it has blackened and charred my soul. I am scarred. I can never purge myself of the shame I feel. In the back of my mind, I will always know that I was an accomplice to torture and murder. For this, I can never forgive myself. But you know, the funny thing is, animals have an incredible capacity to forgive. No matter how badly I have ever wronged them, they have always loved me. They have always welcomed me with open arms to cry on their shoulder, to seek amusement in their playfulness, to be my friend when no one else would. Animals are the embodiment of unconditional love — they are love incarnate. Their love is selfless, endless and pure. How could I ever compare? Am I even worthy of such love? I’m not. But I’ll be damned if I don’t do everything in my power to earn it. The very least I could do is to stop hurting them: to love them as they are, not for what they could be; to hear their cries of anguish and choose not to ignore them; and to stand up for them even if that means I must stand alone. After all, isn’t that what love is? I could not agree more. I have gained far more than I could ever have imagined from being vegan. I have sacrificed much, but I have never sacrificed anything that I have missed. I sacrificed selfishness and hypocrisy for integrity; ignorance and arrogance for enlightenment; and chaos and anger for peace. You may talk the talk, but will you walk the walk? Great post Kara. It’s funny how you can grow up all your life thinking you can”love” animals but not question the many ways you are hurting them & being part of their hell. Only when I became vegan did I realise that true love for animals is selfless. It means letting them exist for their own reasons and not ours. Just because someone ‘owns’ a dog & treats it well does not make them an ‘animal lover’, not while they abuse others by eating & wearing them, or using them for entertainment or buying products tested on them. Thank you. And very true, actions speak much louder than words. Loving only certain types of animals, is a playing of favoritism. The whole subject is fairly complex, because there are so many myths and long-held beliefs, about eating the ‘died-too-soon’ and ‘wasn’t cared for with optimum ability’ animals’ organs and muscle tissues, which had been used for sensing and mobility functioning in their environment. If it can feel, it’s a living creature. How do you know it can feel? Only if you are very calm, could you find out. To be very calm, one can’t always be destroying various creatures’ “lives in progress”, which for them, is just aimed at, say, peace and comfort, even if it doesn’t have an individual personality the way humans are said to. It’s a catch-22 in the sense that he doesn’t want to make people feel dumb for how they choose to eat and live. Many (many) people are particularly stubborn about this topic, because they don’t think they will get the energy requirements for daily interaction, if they were to give up participating in killing animals before their natural death. Thank you, Bea. I know I can’t blame myself for my ignorance, but in many ways I wasn’t as ignorant as one would think. We live in an age of technology and information. We all reach a point where we know that animals are suffering for our food fetishes — as in we know that meat is a dead animal — but still manage to flip a switch in our minds allowing us to ignore it. I knew I was complicit, but I did nothing to change. I just looked around me and saw that everyone else was fine with it, so why should I not be? I wish I could bring back all of the animals I’ve wronged throughout my life, but of course I can’t, so my activism is the only way for me to try to rectify my mistakes. Great blog, and I like much of what you say in this particular post, but there’s one thing about this one that I find puzzling. You speak of animals’ ability to forgive, but you’re not willing to forgive yourself, which I really don’t understand. Aren’t you an animal yourself? And what about us? We all did the same as you, participating in animal exploitation because we were taught by people around us to think of it as “normal” and acceptable, until one day the light bulb went on and we became vegan and stopped choosing to hurt animals. Do you not forgive us, either? (Or people who become vegan in the future?) That would be the logically consistent view, since our actions were no different than yours. And if, on the other hand, you do forgive others but not yourself, why the inconsistency? Why are you judging yourself by a different standard than others? I think I’m harder on myself than I am on other people. You’re right, it is inconsistent. It’s illogical for me to continue to blame myself for actions I no longer do while forgiving others for doing the same things I did in the past. Sometimes I just can’t help wishing I could talk to myself when I was younger and snap some sense into me. But things fell into place the way they did when they did and for this I am glad. For many, this realization never happens at all and then everyone loses. I’m slowly working on forgiving myself. Writing this blog is a way for me to repent and redeem the wrongs of my past. If I can help others make this connection sooner, it will be easier to forgive myself. At least a few times a week I’ll have readers of my blog email me that this or that article helped them start thinking about going vegan or was the final push they needed to go all the way. Every single one of these emails chips away a tiny bit of the guilt I have within me. (that’s in myth 10). So i’m here, in Buenos Aires, i became vegan three months ago, i’m completely sure about my decision, but I find hard to explain to someone how going vegan helps, for example, groundwater contamination, since I don’t know it. Or deforestation. Topsoil erosion, greenhouse gas production. I saw some videos and I’m reading everything I can (that’s how i got here! ), but could you help me with that? Medical issues, for example, I found some articles about how bad milk and milky products are, but I can’t get my father’s wife to stop feeding my little sister with milk. Which is the most “serious”, “undeniable” medical article you know about that? Besides my sister, a friend’s mother is having for dinner “cheese and a glass of milk” since the doctor told her that to fight osteoporosis. She’s a occidental, western cientific believer, she needs “proofs”. !!!! As I write I realize most people won’t hear anyway, or at least that’s what has happened to me in my discussions. It’s hard to transmit that “connection” you wrote about, most people don’t want to even see a half hour video. But it would be good to have all these reasons organized in my head. The thing is I had some sad days living around people who don’t want to hear the first thing about all this: my girlfriend, brother, friends, etc. How do you do it? Sometimes I think I’ll have to go live in a vegan-colony or something (do they exist? ), as I feel treated as “the weird” and no reasons are heard. Sorry for this loooooooooooooooooooong post. Hi, Santiago. Thanks for visiting my blog! First, I must congratulate you on going vegan. You are someone who not only talks the talk, but walks the walk. I totally understand how you feel isolated. I think most vegans have been in that same situation. I even discuss this issue in my post: The 1 Reason Your Vegan Diet Will Fail Every Time. That’s the reason I created Vegan Mentors. It’s a group on Facebook to help keep you connected what we all consider to be our extended vegan family. Vegan Mentors is a group where aspiring and newbie vegans can come to ask questions without fear or judgement or ridicule, to share their experiences along their vegan journey and to feel supported by a network of vegans from around the world acting as one vegan family. There are aspiring vegans and vegan veterans. We are all here to support each other and to help each other become better advocates for the animals and planet we love. Beautiful post and so well put. I totally agree with you. I grew up with cats and gave them all my attention and I also thought this was love. One minute i would pet one, the next I would eat chicken. We are so brainwashed by this speciesist culture that waking up from this matrix takes time to adjust and it is shocking. Great post. I have had all of those feelings myself and couldn’t have put these thoughts into words any better than you did. Thank you for this. Thank you, Kristy. I love your blog! I absolutely love this post. When you talk about being young and being forced to eat animals without question, without a choice, that really got to me. I’m only 16 but I’ve recently found that i really do have a choice, and that being vegan is the right one. It happened about a very simple but beautiful story, really. Anyways, i really appreciate this post. My parents may have been oblivious to choice then, but not now. They know, as well as many others, of the horrors that animals endure to please our taste buds. The sad part is, they continue to carry on like they never heard it. Sometimes i feel alone in my journey to become less selfish, and it really boggles me when others oppose my choice or even question it. Seeing posts like these really hearten me. Thank you. Thank you so much for sharing your story. So many other people would have walked by that deer and thought “cool” and gone about their day, have a steak dinner for instance. But in that moment your consciousness shifted to a more enlightened state and you were able to see the connection between us all. I’m sorry your parents still haven’t come to the same realization you have. It can be tough, especially when you still have to be around them, live in their house, etc. 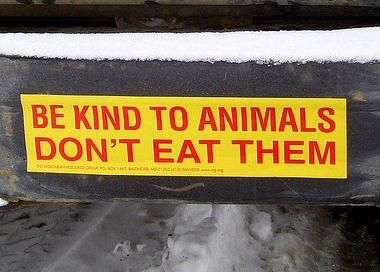 But the good thing about parents is that you can usually pester them more than other people about animal rights issues. They’re kind of stuck with you, you know? Hehe. I’m glad this post helped you and if you need support, I’m always here. Wow you sure sound like a smart one. Do the best you can until you know better. Then when you know better, do better.” – Maya Angelou. Reblogged this on pink and passionate.